Put some brain power in your security. Our network threat protection platform, harnessing deep learning, stops known and unknown threats in less than a second. Learn how deep learning can address the automated threat landscape. Attackers are weaponizing AI to accelerate the distribution and creation of threats. According to research by AV-Test, more than 121.6 million new malware samples were discovered in 2017. That’s 333,000 new samples each day, 230 new samples each minute, and nearly 4 every second. Existing defenses like signatures and sandboxes simply can’t keep up. 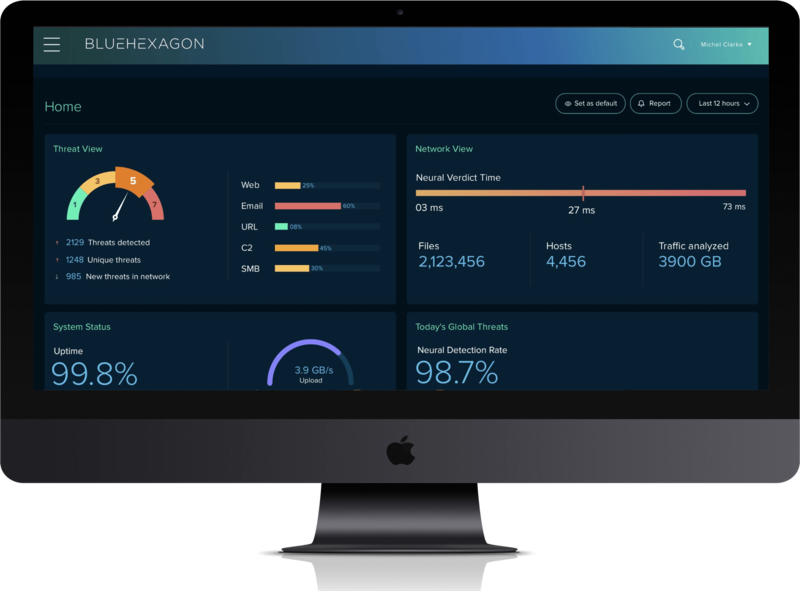 Powered by a patented architecture of deep learning neural networks, our Blue Hexagon platform delivers threat inference on 10G traffic in less than a second. When we say real-time, we mean it. Threat detection occurs in less than a second with complete threat categorization and full kill-chain context. Proven in enterprise environments and rigorous lab validation, our solution not only works for known threats but also zero days seen for the very first time. Our solution works out of the box on day one. Our deep learning models are pre-trained in the cloud. No on-premises tuning or baselining is required.